Are you looking for innovative ways to engage in meaningful, impactful conversations in your workplace, community or family? Are you interested in new forms of leadership that generate fresh thinking and create a shared commitment to solving critical challenges in sustainable and inclusive ways? Many of the problems and issues we face in our organizations and communities can only find creative and wise solutions in collaborations with others. No matter what sector we work in, what community we live in, or what family we were born into, we are all faced with situations that demand people working together across their differences. 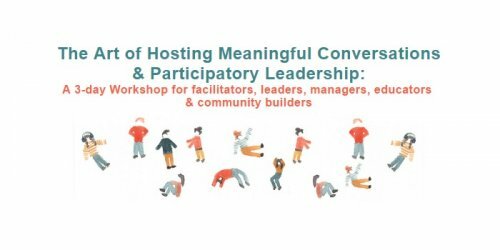 The Art of Hosting is a participatory approach used worldwide for leading, convening and engaging in a depth of conversation and leadership that transforms our relationships and gets the necessary work done. Drawing on centuries of human wisdom as well as some new ways of thinking about how we work well together, the Art of Hosting is accessible and engaging in a wide range of contexts. Build Stronger Teams and Partnerships. Broaden the skill set within your group, work more effectively and enjoyably together, engage teams, organizations, and community stakeholders in meaningful conversations that promote resilience, belonging, innovation, and collective impact. Apply what you are learning directly to the change projects that are important to you, your community or organization. Experienced and young emerging leaders, managers, facilitators, teachers, community builders, public officials, social innovators, educators and anyone attracted to the call!